Poplar bud gall mite are tiny members of the eriophyid mite family, about .2 mm. long. Microscopic though they are, the insects can do significant esthetic damage to trees like poplars, cottonwoods and aspens. 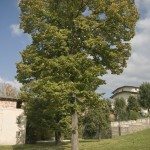 If you have these poplar tree pests, you’ll want to read up on procedures for getting rid of eriophyid mites on poplars. If you see woody galls developing on the leaf buds of your poplars, you’re probably dealing with poplar tree pests called bud gall mites. Galls are cauliflower-textured growths you see developing in the branches of your trees. These mites stop leaf buds from growing the normal leaves and stems you might expect from a poplar tree. Instead, gall mites on poplar trees cause the buds to develop into woody galls, usually less than 2 inches in diameter. The mites spend most of their lives inside the galls. Poplar bud gall mites spend the entire winter inside the galls and sometimes under bud scales as well. They become active in April and stay active until October. 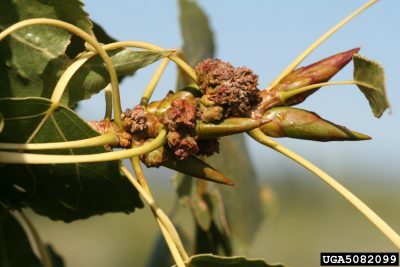 From May through August, mites move from the galls to leaf buds, where they form new galls. The gall mites on poplar trees can stay active for four seasons. Although the poplar tree pests do not have wings, they are small enough to drift on wind currents to nearby trees. Some also get a ride to other trees by clinging to birds or bigger insects. Getting rid of eriophyid mites on poplar trees starts with using your garden pruner. Wait until early spring when the trees and galls are dormant. 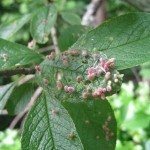 The easiest way of getting rid of eriophyid mites on poplar trees is to remove each and every gall from every tree on your property. Don’t think that removing most of them will do. A single gall contains enough mites to reinfest the tree. What to do with the galls? Do not toss them in the compost! Instead, burn them or dispose of them off the property. This works best on small trees, less well if the tree is huge. So what kind of poplar bud gall treatment will work on big trees? You can try broad-spectrum insecticides for eriophyid mite control, but some arborists recommend against it. Since mite insects on poplar trees rarely do serious harm to trees, you might just want to let nature take its course.